Our ministries are designed to lead people to deeper worship, authentic community, meaningful service, and personal growth. There are ministries for all ages that are engaging, relevant, and practically helpful. 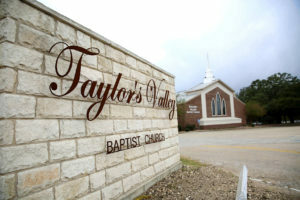 New to Taylor’s Valley Baptist Church? What time are services and where is the church located? Our Life Groups meet at 9:15 AM and our worship service is at 10:30 AM every Sunday. The church address is 2497 W FM 93, Temple, TX 76502. When I attend for the first time, where do I go? When you arrive on Sunday morning, located in the back parking lot directly in front of the main entrance, we have reserved parking for our guests. Our greeters will point you in the right direction if you should need their help. When you walk through the main entrance, take a few minutes to stop by our Connection Center in the lobby. Meet our Connection Team, ask questions, and receive a gift we have for you. If you have kids, and you arrive for Life Groups at 9:15 AM, someone from our Connection Team will be at the Connection Center to assist you and get everyone connected to the right group. Wear what you’ll be comfortable wearing. Dress is relaxed and casual.